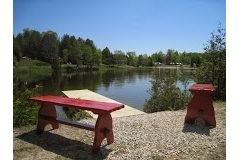 Established in 1980, Shamadon Resort is a beautiful family-oriented campground located in West Grey County. If you’re looking for a quiet getaway from the city, this is your place. We have over 90 full hook-up sites located on 127 magnificent acres of land. And yes, we are Big Rig friendly. Our campground has something for everyone-a sandy beach, soccer field, fishing hole, heated swimming pool, nature trails, dog run, Koi pond, exercise equipment and even peacocks!